Today (May 4th) marked the day when I left my home country Philippines. My port of entry was Guam, I arrived there early morning of May 5th. I was seven months pregnant when I flew going to Guam. Luckily Philippines is just a 4-hour flight to Guam. I was scared to go because that was my very first to to fly alone and it was going out the Philippines, geezawhiz. Imagine what thoughts were running in my mind lol. Since preggy tales is what the theme for this week's Mommy Moments, this will be my entry too. These are a the folks that I met in Guam. Hubby and I stayed there for a couple of days and then we flew coming here. I was really tired but what can I do. Good thing that my daughter was a real trooper. I was running at the huge airport in Houston in order for us to catch the connecting flight. Hubby left me just so he could tell our flight to wait for us. That was a flight I could never forget. The moment I set my feet on the plane, the content of my tummy just came out lol. I have been living here for more than four years, two years in Korea, and I have been away from home for six years. I miss home! Sorry Guys, I have been away from my PC for a while so pardon for my late posting to Nostalgia. Thanks once again for taking time to share your nostalgic moments with us this week. Please invite others to join, the more, the merrier, right? How I wish to step in a plane as well going there, nyahahaha nangarap mine is up na mommy. You haven't been back home in Phil for 6 years now Rose? Akala ko ako lang ang mas matagala hindi pa nakauwi. Been three years now and possibly another 3 years. Hu! Been missing Phil so bad. 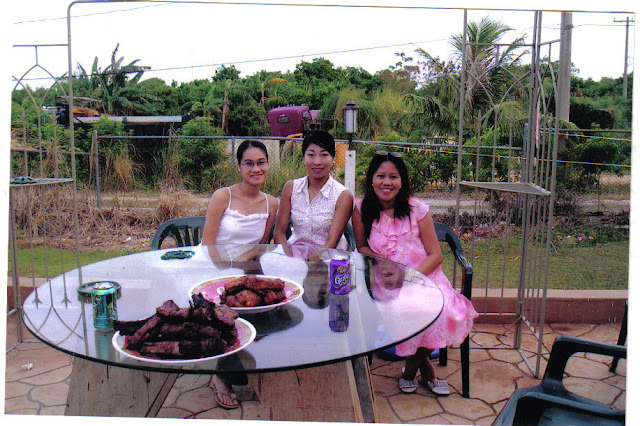 Hi Mel, I went home twice already nung andun kami sa Korea, mas mura kasi ang airfare hehehe..
Hello mommy Rose! Thanks a lot for inviting me to join this meme. SanFo pa rin ang entry ko. More pictures from the past next time. Oi, ang tapang mo sis. Kung dun ka sa plane nanganak, hambambuhay libre si ms burrito sa airfare, hehe. 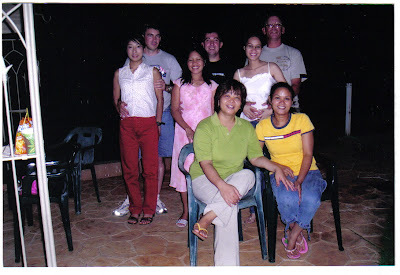 for sure miss m na nga family mo dto sa pnas medyo tagal na rin pala 6 years is something. for sure pag-uwi mo daming bit-bit para sa kamag-anak dami kanang face na di kilala.. hahaha... although been on a flight alone... di pa palabas ng pinas.. hehehe.. mine is up Rose. I'm not sure why but I feel you...I'm missing "home". Since I married and moved here with hubby, I feel like the place where I grew up is so far from here but in fact, it's just a ride away. Sabi nga nila, "there's no place like home" and Philippines is your home. Hope you can drop by my site and check out my post too. Thanks and see you around! yay, ang hirap siguong bumiyaheng buntit..at sa plane pa na pagka haba habang biyahe...ang galing ni Rye'ng kumapit heheeh. Nakakamiss nga naman talaga yan Rose. There's no place like home pa rin but it's a different story now coz you have built your own home sweet home. Managed to somehow publish my entry for this week. Reading your story reminded me of my first flight ever outside of the Philippines and that was when we flew here in the U.S. And even though kasama nami ni Yogi si hubby, sinundo niya talaga kami, I was a bit anxious pa rin. It was a 4 hour flight from Manila to Japan, then 12 hour flight from Japan to Atlanta. Pagdating ng Atlanta, hilo na ako. Hehe. hi sis. i joined this week's nostalgia. i'm not sure if i did it right kasi wala namang instructions. anyway, musta na? how was your BIL's operation? regards! Wow! you are brave sis, traveling alone while you are pregnant. I don't know if I could handle it. Nakakamiss talaga ang homeland natin :( Im glad you had a safe flight then, preggy ka pa pala nun. Nakakatakot naman kasi talaga lalo na kung first time diba.. Yes, going to America was the turning point in your life. It was also an assurance of a better life for your children which you could hardly get in the Philippines. Thanks for the post. God bless you all always. kaganda namang buntis nyan. i like your maternity dress Tokaya. hi sis! di ako nakacomment dito at nag hang kagabi..
Hope You can come and visit my MM: Preggy Tale too. for a pregnant woman to travel alone is very scary; but you made it there Rose... :-)! and now, you are here! hello sis! coming back from my mommy moments entry. Thanks for the visit and for the comment ha? Hope you can also join Messy Go Round . Thanks and see you around. and oh, happy mother's day! Wow! I can imagine how it is traveling (on long flights) with a huge tummy! I traveled too when i was five months preggy and yet it was still a torture! thanks for visiting my preggy tale. will check on your meme too! Happy Mother's Day! yeah i knew it..you are tough woman..hehe! good that everything went fine anyway. thanks sis for inviting me nostalgia..i will join next week... is this every friday? uggh! that must have been difficult..